I am not sure if this is intended or not, but the werewolf minions disappear from the map on their own. Nobody is burying them with a shovel or eating them with dog or zombie. You can easily check that by taking note of all the animals you kill as werewolf on night 1. You can easily see that not all of the killed animals spawn as werewolf minions on the next night. I have never seen a late game on 1.26, like the good old time, where the whole map is crawling with werewolf minions. This significantly nerfs the werewolf Mutation ability, giving advantage to coffee brewers to progress faster than wolf at later game. In my opinion the game should follow the mechanics of making wolf stronger and stronger as the game progresses, but it seems that villagers have more options to develop faster than the werewolf in the long run, making their heroes op. Last edited by SarKonTaLk on Thu Aug 11, 2016 7:05 pm, edited 1 time in total. 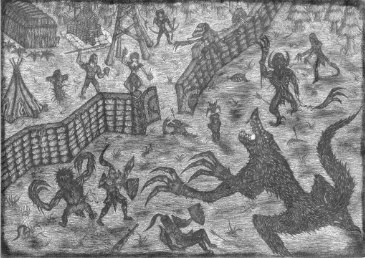 But when he uses his army of villager and his army of wolf together at night, is something to be feared, I think this something good werewolf, could improve a little more, but if at the beginning without followers is a machine to kill. I believe Pwnage. has already patched this for v1.27. Or at least attempted to. I do believe we had some difficulty figuring out why this is occurring (corpses are supposed to be permanent). As a general update, this problem seems to be inconsistently present in games. Units typically disappear when near or on buildings, which seems to have a snowball effect to the surrounding units. Have to do more testing to confirm this. I originally thought this was the fault of the animal relocate system designed to move animals from spawning within bases, but it's possible I overlooked something or this was not the case at all. I would like to confirm that this bug still occurs on the present version 1.27.01 . For example: It is really annoying to kill 12+ animals on night 1 and get only 1 or 2 minions on night 2. As far as I can remember the bug was not present on version 1.25. Reviewing the changelog from 1.25 to 1.26 might give you some insight into the cause of the problem. Still here on 1.27.02. I remember back in the days that the original map editor had a limit for some of the map pieces (trees,corpses,decorations, etc) . When you introduced the double-tree fix (for the weather effect) you doubled the trees in the map. Is it possible that might be the cause of the corpses glitch ? too many corpses/trees and the engine just removes some of them to handle it? I am just shooting in the dark here, but apparently you still haven't found the cause of the problem. Or it might be somewhere in the code for animal transportation/teleportation? This is a hard one to hunt down because of how much code we actually have in the map that could be the cause. If you guys have any details to add it would help tremendously. If we can't find an event that causes things it makes it very difficult for us to fix and test because we cannot "force" an event to occur which lets us systematically test changes and evaluate results. Well we don't have access or understanding of the code behind the map. I can confirm that the old minion system (where we had different minions) didn't have the bug.